CAVEAT: If you think the President is handling the Libya crisis well, you may find these comments offensive yet enlightening. 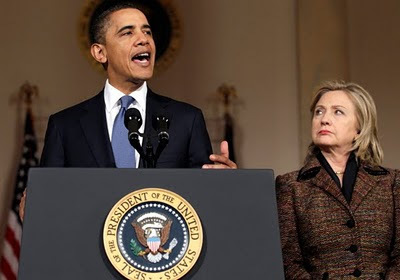 I have tried to understand why President Barack Obama and Secretary of State Hillary Clinton seem to ignore every principle of foreign policy taught at leading international relations schools and military institutions, not just in this country but around the world. I might give Mrs. Clinton a pass since she may be in the position of having to represent an ill-conceived position as she works for the President. Then again, if she does not agree with the Obama policy, she can resign - it merely takes a phone call and she doesn't need the money. Where do I start? I was astounded by the earlier bifurcation of the President's policy and his military strategy. As I said in a previous article, any graduate of our professional military education institutions understands that military power and its application is but one component, one tool of foreign policy, just as is diplomacy. Both are used to advance foreign policy objectives. Stated another way, diplomacy and military power are both used to achieve foreign policy goals. Applying that theory to reality, President Obama has stated that U.S. policy is the removal of Mu'amar al-Qadhafi from power. The President has made that clear (he is big on clarity) on more than one occasion. If that is the goal, then American diplomacy should be geared toward that. If diplomacy fails, the President also has the military option to achieve that aim. Inexplicably, that did not happen. The President, for reasons that most of us cannot understand, has separated foreign policy goals from its components. When he articulated the reasons the United States supported the adoption of United Nations Security Council Resolution 1973, the President stated that although it was U.S. policy to support the removal of Qadhafi from power, the use of force under the resolution was not to achieve that goal. If you are not using military force to achieve a stated policy objective, why are you placing young American men and women in harm's way? That is inexcusable. That said, perhaps the most egregious failure to grasp the realities of what is happening in Libya is the bifurcation of the military operation. Since the beginning of the military campaign on March 19, Obama has tried to downplay the leading role of the U.S. armed forces and was looking for a way to pass off leadership to another entity, in this case NATO. That's okay in and of itself, but it was the convoluted agreement reached by the leaders of the NATO nations that is dangerous and confusing. NATO works on a consensus basis - all 28 nations must agree. In its haste to transfer leadership, the Obama Administration violated one of the key precepts of military operations - unity of command. What Obama and Clinton agreed to comes as a shock to any professional military officer. 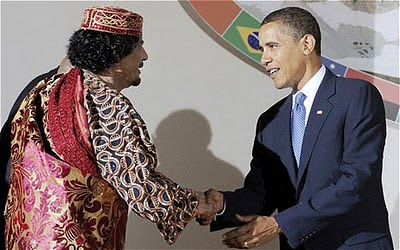 Under what I will call the "Obama Abdication," the President agreed to cede command and control of the no-fly zone enforcement portion of UNSCR 1973 to NATO, but retains (via the U.S. Africa Command) responsibility for the portion of the resolution that applies to the protection of Libyan citizens from the brutality of the Qadhafi regime. This is a formula for disaster. NATO forces operating under one chain of command will enforce the no-fly zone, while at the same time in the same air space American forces, possibly with other allies, in a separate chain of command will enforce the protection of civilians portion of the resolution. Two command structures in the same space at the same time? This is dangerous work under ideal circumstances. There will be young men and women operating high-performance lethal weapons systems in close proximity against one enemy who has, through no machinations of its own, retained a key tenet of military operations - unity of command. There needs to be one commander focused on one set of military goals. Today's agreement does not do that. It is obvious that the two-tier agreement took some arm twisting, otherwise Mrs. Clinton would have been on time for her announcement, rather than spending time on the phone begging and cajoling her counterparts at the last minute. This is probably the best she could do in an attempt to execute the wishes of the President to abdicate leadership of the operation. The fact that the President of the United States and the Secretary of State agreed to ignore a basic military concept underscores their lack of understanding of the military option. Neither one of them have the background or experience to be making these decisions. What they did today is dangerous for our troops and our country. Mr. Obama, the next time the phone rings at 3:00am, please don't answer it. The caller will understand - you can explain that you were appearing with Ted Mack on Amateur Hour. 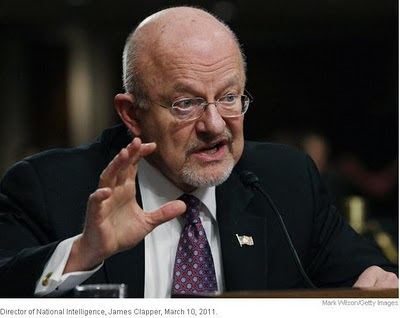 Director of National Intelligence retired U.S. Air Force Lieutenant General Jim Clapper is being criticized for his analysis at a hearing of the Senate Armed Services Committee on March 10. He described, correctly in the context of his statements, China and Russia as "mortal threats" to the United States. Several Senators expressed concern that General Clapper did not cite either Iran or North Korea as "mortal threats." Given the general's long background - almost five decades - in the intelligence community, his remarks are understandable. Russia and China possess the capability to strike the continental United States with nuclear weapons. As he also stated, there currently does not appear to be any intent on behalf of either nation to exercise that capability against the United States. Intelligence analysts deal with two factors: capability and intent. Clapper addressed both, accurately in my opinion. 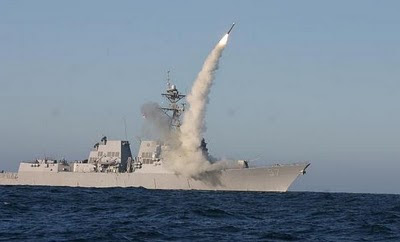 Both nations have the capability to pose a "mortal threat," but there is no indications of hostile intent at this time. Conversely, Iran and North Korea, with limited capabilities, may pose a threat to U.S. interests in the Middle East and East Asia respectively, but neither country's capability rise to the level of a mortal threat to this country, regardless of their hostile intent. 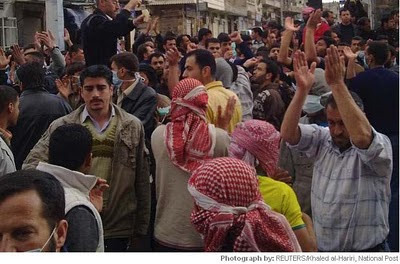 Israeli analysts have described Iran in different terms, however, labeling the Persian Gulf power an "existential threat" to the State of Israel. We are not Israel, we are not within range of Iranian missiles (yet). It was after Clapper offered his analysis on the situation in Libya that some Senators called for his resignation. I am not sure why - perhaps his analysis was not what they wanted to hear. In defense of Jim Clapper, what he said was entirely accurate. Clapper's assessment is not what the President wishes the situation to be, it is the situation as it is on the ground. None of the Senators has the military or intelligence background to challenge that assessment. Before I continue, a disclaimer. Jim Clapper is both a professional colleague and a personal friend. I have worked for the general on several occasions, and have participated in professional fora with him. His experience is broad and his accomplishments are many. Let's take a look at General Clapper's assessment of the Libyan situation. You can watch the general's remarks here. GEN. CLAPPER: — that over time, I mean — this is kind of a stalemate back and forth, but I think over the longer term that the regime will prevail. In response to calls from Senator Lindsey Graham for Clapper's resignation, the White House tried to rehabilitate Clapper's analysis. They should not have done so - Clapper was right. Senator Graham should stick to that part of the military he understands, that of the judge advocate general corps, basically the lawyers. We need good military lawyers and we appreciate his service, but before he criticizes General Clapper, he might want to learn something of desert warfare, air power, insurgencies and the Libyan armed forces. 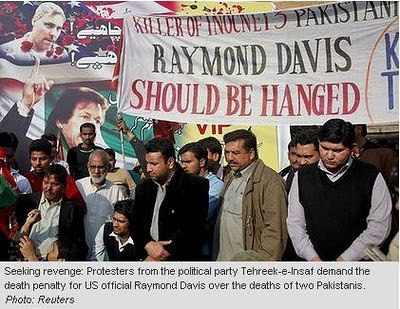 Just because President Obama has called for al-Qadhafi's removal, words will not make it so. In the absence of external support, such as the imposition of a no-fly zone over the country, General Clapper's assessment that the al-Qadhafi regime will prevail is spot on. 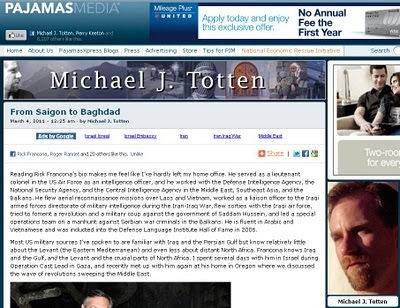 Author and journalist Michael Totten and I met on a trip to Israel during the Gaza conflict in 2009; he and I sat down for a conversation about the current situations across the Middle East. Click here or on the image to read the transcript of the conversation. Michael's latest book, The Road to Fatima Gate - the Beirut Spring, the Rise of Hezbollah, and the Iranian War Against Israel, has just been released. 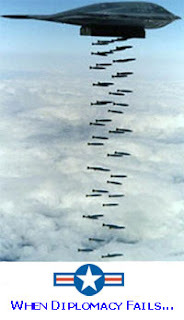 There have been calls and suggestions, or what Secretary of Defense Bob Gates describes as "loose talk," for the imposition of a no-fly zone over Libya, similar to that imposed over Iraq in the aftermath of the Persian Gulf War in 1991. That no-fly zone was in place until the U.S.-led invasion in 2003. Could a no-fly zone be successfully imposed over the vast expanses of Libya? Yes, but not without cost. It is one thing to pass a United Nations Security Council resolution declaring a no-fly zone; it is quite another to enforce it. Demanding that the Libyan air force stop flying in its own airspace does not mean that they will comply. There will have to be credible military force available to impose such a zone. The major component of that "credible military force" will almost certainly be aircraft and pilots of the U.S. Navy and U.S. Air Force, operating from carriers in the Mediterranean (the USS Enterprise is en route) and air bases in "friendly countries," most likely Egypt but possibly Italy as well. No doubt there will be participation from other countries to put an international face on it, but in the end, most of the serious flying will be done by young Americans. 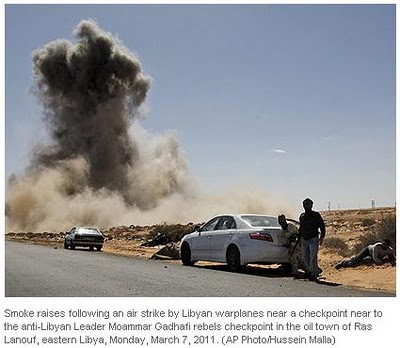 What are the considerations involved with enforcing a no-fly zone over Libya? The obvious consideration is the capability of the Libyan air force and air defense system. Given the rhetoric emanating from Tripoli in a series of rambling nonsensical speeches, it is doubtful that Libyan leader Mu'amar al-Qadhafi will order his aircraft to stand down, nor will he order his air defense units to refrain from engaging foreign aircraft operating in Libyan air space. On paper, Libya's air and air defence forces appear to be formidable, but in reality are not. While the fighter aircraft inventory tops 200, most are older Soviet jets such as the MiG-23 (NATO: Flogger); most are likely no longer in service. There are possibly a few French-built Mirage F-1 fighters operational as well. Two of these were flown to Malta by pilots who chose to defect rather than launch air strikes on their own citizens. There are dozens of heavily-armed Russian Mi-24 (NATO: Hind) attack helicopters that can inflict massive casualties on civilian populations, as we well know from Iraq's use of these very effective weapons platforms to put down the Shi'a rebellion in 1991. It is these helicopters that need to be grounded, or if the pro-Qadhafi forces insist, destroyed. 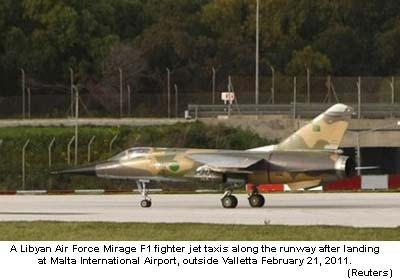 Neither the aircraft nor pilots of the al-quwat al-jawiyah al-libiyah, the Libyan Air Force, are capable of taking on state-of-the-art American F-15, F-16, F-18 and F-22 fighters flown by well-trained, combat-experienced pilots. The Americans can sweep the skies of any Libyan aircraft whose pilots are foolish enough to attempt a challenge. That is not the issue. 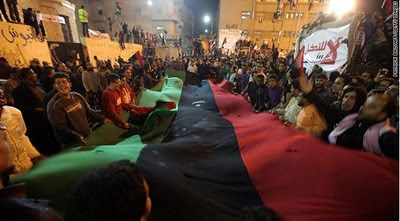 The issue is first destroying the Libyan air defense system. Like most former Soviet client states, Libyan air defenses are multi-layered, dense and redundant, combining long and short range missile systems integrated with anti-aircraft artillery guns under a centralized command and control system fed by a network of surveillance radars. The first task of imposing a no-fly zone is to neutralize that air defense system. Although it is possible to jam radars and some communications systems using non-lethal means, that is only a temporary solution. To provide the security the pilots will need to conduct effective no-fly zone enforcement, the air defense system needs to be crippled. Those who favor the imposition of a no-fly zone need to understand clearly that it will begin with air strikes on Libyan air defenses. 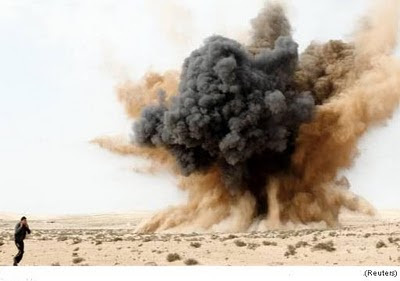 When that happens, there will be images beamed all over the Middle East and Muslim world by media outlets such as Al-Jazeera and al-'Arabiyah of American aircraft dropping bombs on an Arab and Muslim country. Arabs and Muslims will die at the hands of American pilots; the media in the Arab and Muslim world will make sure it is well covered. For the record, I am in favor of a no-fly zone. I am in favor of anything that hastens the removal of Mu'amar al-Qadhafi from power. I am in favor of protecting any Libyan with the courage to face al-Qadhafi's armed forces in hopes of freedom and a better life. We just need to make sure we know what we are getting ourselves into.